People who eat more fruits, veggies, whole grains and beans tend to get less cancer. That may be because those foods are high in antioxidants — chemicals that fight the cell damage that leads to cancer. Besides fresh produce, canned and frozen fruits and vegetables have many of the same important nutrients. Be mindful of canned goods, as they may contain more salt. On the other hand, if you eat a lot of fat, sugar and refined carbs (like white bread), you’re more likely to gain weight and become obese. Obesity is linked to several types of cancer, so it’s important to keep your weight low. Try to limit your carb intake to < 30 grams per serving. Are you at a healthy weight? Check your Body Mass Index (BMI). Try to eat at least 2 1/2 cups of fruits and vegetables every day, and get a variety of types and colors. Be adventurous; try something new! Choose whole-grain products, such as breads, pastas and brown rice, instead of those with refined grains. Quinoa anyone? Avoid high-calorie processed foods and sugary beverages like soda, sweet tea, and juice-flavored drinks. Also watch those flavored waters – read your labels. Reduce your intake of processed meats such as bacon, sausage, lunch meats and hot dogs. Choose fish and poultry instead of red meat. If you eat red meat, choose lean cuts and smaller portions. Try to drink at least 64 oz. of water a day. Drinking too much alcohol is also linked to several types of cancer. All types — beer, wine, and spirits — seem to raise your chances. Limit yourself to one drink a day (1.5 oz. liquor, 5 oz wine, or 12 oz beer) if you’re a woman and two drinks a day if you’re a man. Besides healthy eating, physical activity is important for reducing your cancer risk. Learn more from the American Cancer Society. 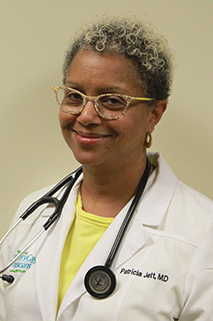 Dr. Patricia Jett is a Maryland Primary Care Physicians, LLC partner and practices in MPCP’s Annapolis office. She is certified by the American Board of Family Medicine. She received her medical degree from the University of Maryland School of Medicine and completed her residency program in Family Practice at Franklin Square Hospital Center.